In a pond containing few fish you need hardly feed your fish. Small fish are very well capable to gather their own feed. They eat insects and larvae which naturally live in a pond. 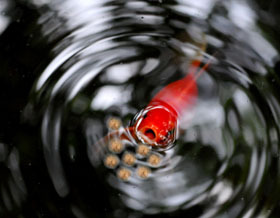 However, if you have many fish in your pond or large specimens, feeding your fish will be necessary. Attention! Never feed too much. Take care that your fish will eat the feed distributed within a few minutes. Feed that is not eaten will be additional waste in your pond and will burden biological equilibrium. Consequently there will be algal growth and turbid water. In wintertime you should stop feeding fish daily if water temperature is below 10°C is. Start feeding fish daily again at a water temperature of 10 °C or higher. At lower temperatures metabolism of (cold-blooded) fish is so slow, that they hardly need any feed. In this period you should restrict the amount of feed. At low temperatures (10 °C or less) you can suffice by administering 1 or 2 times a week an amount of winter feed by hand. Finally we advise you to purchase always proper quality of fish food. Healthy fish are characterised by a beautiful range of colouring and stable growth. Certainly for lovers of koi carps sophisticated feed is important.